Happy Monday quilting friends! Kick off your snow boots and come on in. 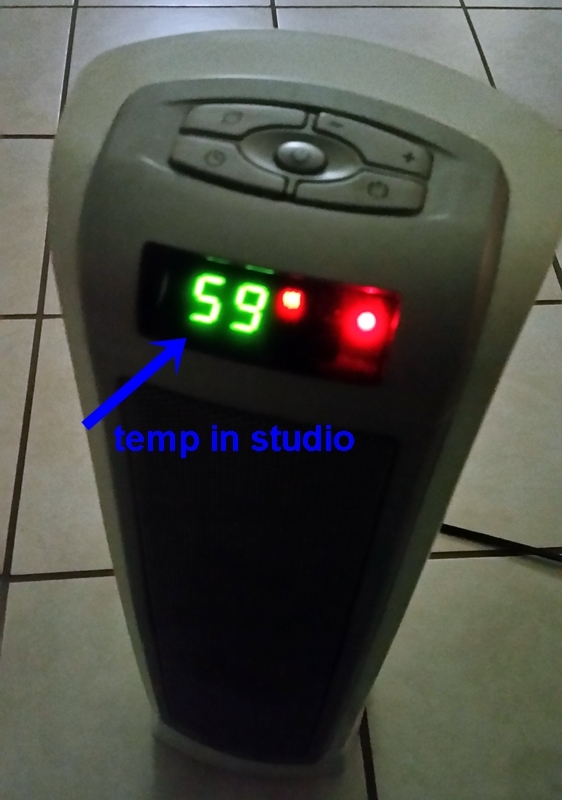 You might want to grab a cup of something warm and shimmy up close to my space heater cause it's a little chilly in the Podunk studio. I've got something to share with you today that is sure add a little sunshine to this cold day and warm things up. It's taken just a little over a year to finish but it was worth the wait. 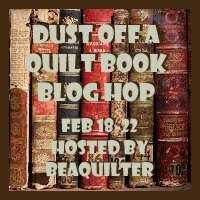 Every November Bonnie Hunter shares a free Mystery quilt. This was the Mystery for 2016/17 called En Provence. 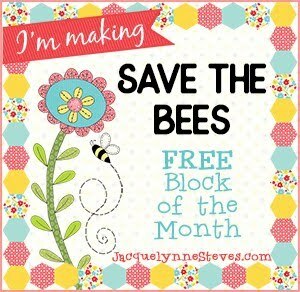 It's no longer free but the pattern can be purchased here. 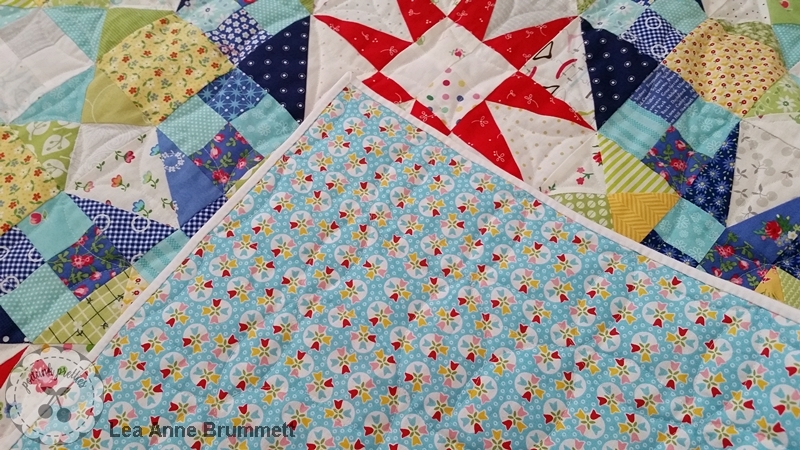 Being a Bonnie follower for around 10 yrs you would think I had made one of her quilt patterns by now. Bonnie's style is super scrappy and more often than not I'm in awe of her creativity. So finally I took on the challenge and swore to the fabric fairies above to keep up with this mystery. Bonnie crams it all into about a month so it should be easy. You see, I've tried other mysteries and block of the months over the years and usually I poop out around month three or four and they become UFO's. I tried my best, I swear I did, but something happened when it came time to add the borders to this quilt. It was shoved in a box and....a year later it was brought out to be finished. One of my ideas to help keep me motivated to finish was to use only fabric I LOVED. The backing is from the Riley Blake line Bloom and Bliss by Nadra Ridgeway. It was a great thrifty find at Ben Franklin Crafts in New Albany Indiana for $2.99 a yard. The colors were perfect! 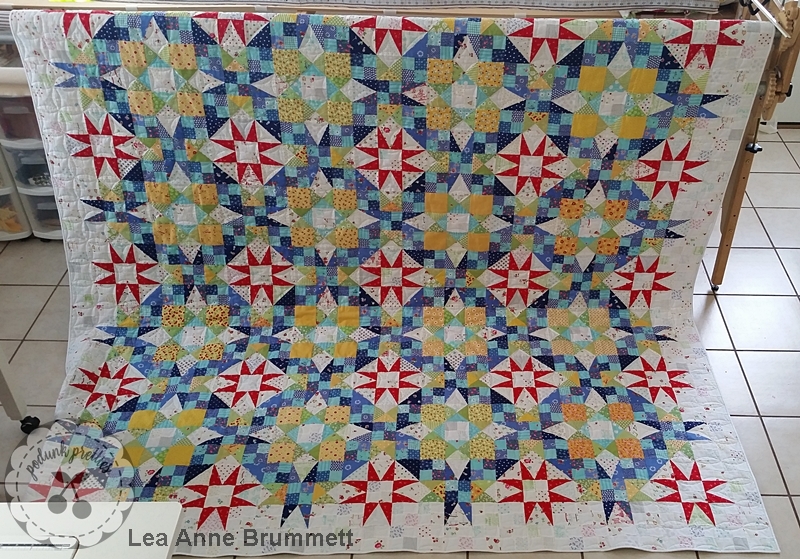 Because this quilt ended with pieced borders, a very small quarter inch binding was used to finish the quilt with out adding any more color or movement. 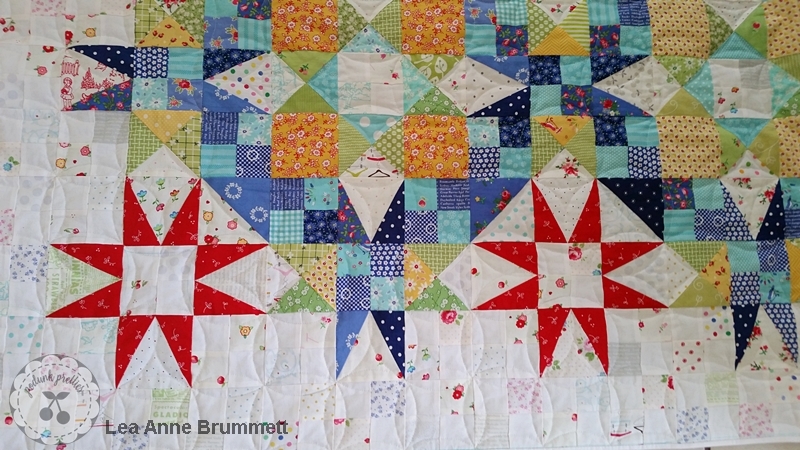 I love how the red star stops the quilt but the quilt continues out past them with little pops of low volume prints. Now that its complete I can honestly say I love it. Will I do another Bonnie mystery? Never say never....maybe after all the clues have be revealed. Thanks for stopping by my little spot in Podunk. So pretty! 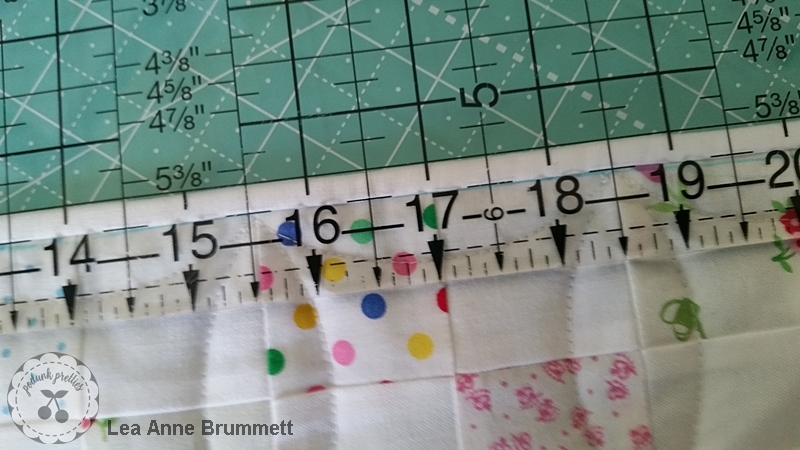 Love your colors and the 1/4" binding is a great idea! I made one Bonnie mystery quilt several years ago. It doesn't work out for me to try and keep up during the holidays, so I have been saving the clues for "someday" when I have the time. I like my scrappy quilts a little more controlled, so I think if I do another one, I will use 4 or 5 fabrics in each color instead of tons of scraps. This is just absolutely beautiful, Lee Ann! 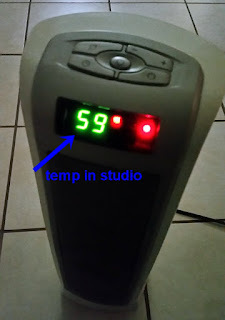 I'm used to cold temps(Iowa here) but truly...do you wear boots and a winter parka in your studio!! lol You said, "I love how the red star stops the quilt but the quilt continues out past them with little pops of low volume prints." That was spot-on to what I was thinking. Your finish has spurred me on to complete at least one of the two Bonnie quilts I have in progress!! Yikes! It's beautiful! Maybe between that and your heater you will stay warm? It's gorgeous! One of the fav's of all the EnP's I have seen, I just love your color choices. SO gorgeous! I love your colors and fabrics. I copied down all the instructions for maybe making later. 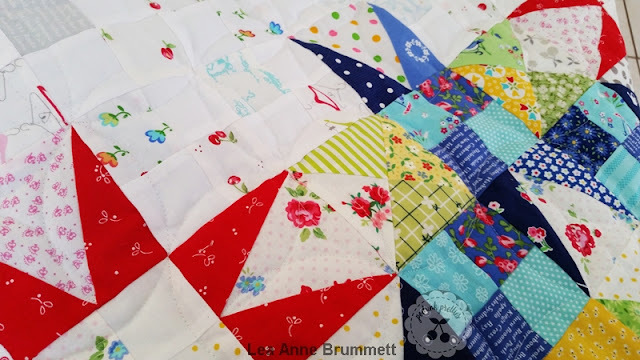 I haven't made a Bonnie Hunter quilt before. Great finish!! It turned out gorgeous! Beautiful Lea Anne! Bonnie was our national teacher for our guild in April last year. She amazes me with her tiny scraps and the beautiful quilts she creates from them. I generally prefer a little more organization, but may give it a go one day! I love your choice of fabrics and colors. Great finish!! Lovely!! I especially like the background fabric with it's bits of color. Congratulations, Lea Anne, it's beautiful! And I like your quilting strategy too. It is spectacular! Makes me want to get mine out and finish it! Such a great finish to start the year off! This is a lovely finish. I do like your thinking about only using fabrics you really liked. It is a beautiful quilt. I just finished mine so I had to pop over and see yours... it's spectacular! I love the photo in the snow! 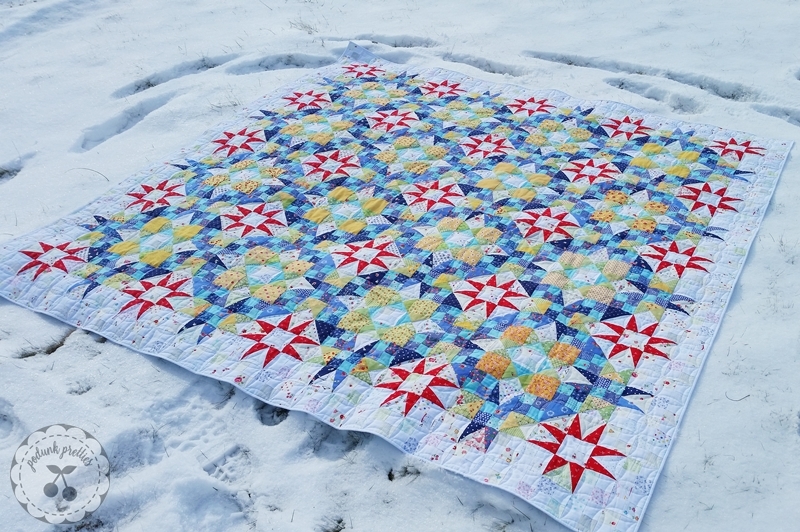 If we ever get enough snow here (so unusual not to have piles of it already) I'll take one of my quilt in the snow too!